Susan Sommer-Luarca was born and raised in southwest Missouri on her family’s farm. Susan grew up with respect, love and compassion for all animals. At the early age of eight and with no formal training, Susan was drawing and painting the many horses on the farm with great attention to detail. As Susan grew, so did the scope and scale of her art. Susan has been painting larger than life murals and fine works of art for more than twenty years, detailing wildlife and its habitat for all to enjoy. From her huge eighty-foot life-size blue whales to stampeding wild horses, Susan has painted her murals across the USA. Over twelve years ago Bass Pro Shops, a world-wide and known supporter of conservation and wildlife recognized Susan’s artistic talent and her love for all that is wildlife. Bass Pro Shops commissioned Susan to paint her larger than life murals in many of their Outdoor World stores across America. In 1995, Susan painted what at the time was the largest continuous indoor mural in the United States. At over 14,000 square feet, the mural depicted an underwater scene with an array of oceanic life including coral reefs, whales, sharks, stingrays and a variety of other sea life. Susan’s work has been seen and aired by many of the major media outlets including, NBC, CBS, ABC and People Magazine-just to name a few. In 2006 Susan started her own wildlife conservation and preservation foundation, the “Susan Sommer-Luarca for habitat” (SSL4HABITAT.ORG) which was formed as a non-profit organization. Susan is committed to her vision of gaming awareness to the necessary preservation of wildlife and its supporting natural habitat. Susan intends to help educate the world through her larger than life murals which will be painted from coast to coast and around the world. Susan serves as a board member and helps raise funds for the Alzheimer’s Association. Susan began the first “Memories in the Making” program for Alzheimer’s patients in southwest Missouri. Her mother is stricken with early-onset Alzheimer’s. While caring for her mother, she encouraged her to paint, and found that it was a remarkable therapy for her. Thanks to this new program, this therapy is now benefitting not only to Susan’s mother, but to so many other patients yearning to express themselves. Susan’s talent to paint not only wildlife but a varied subject matter in any number of different mediums has been recognized throughout the art world from Susan’s abstracts to realism, fine art paintings and sculptures. In 2003, Susan was commissioned to create the Official P.G.A. tournament painting for the Price Cutter Championship. Susan was the first woman to be chosen for this distinguished honor. Susan was honored again when she was chosen the following year (2004). 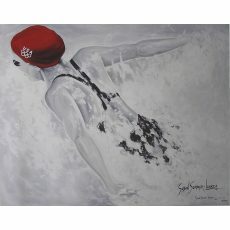 Both paintings were inducted into the Sports Hall of Fame in Susan’s home state of Missouri. Susan was commissioned to design the official sculpture for the decanter of “Triple Crown Winner” and racing legend, Seattle Slew. This was a rare opportunity to commemorate such an important horse in “Triple Crown” history. Due in part to her mastery of these areas of art, in 2007 Susan has been chosen to paint at the Preakness, The Belmont Stakes, and the Kentucky Derby. 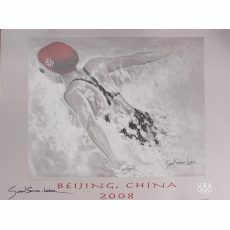 Susan was chosen in 2007 to be an Official Artist for the United States Olympics in the 2008 Beijing Summer Olympic Games. 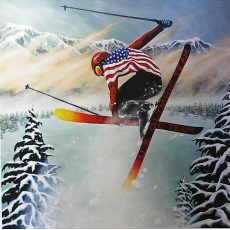 Being chosen as an Official Olympic Artist, Susan follows in the footsteps of other known internationally acclaimed artists including Andy Warhol, LeRoy Neiman, Peter Max, Michel Delacroix, Pierre Matisse and other chosen for this rare distinguished honor. Though honored with the notoriety and recognition of working on an international scale, Susan’s heart and passion remain in her art.